My daughter is a big pasta fan - her current craze is home made pasta, so whenever we make pasta these days - it's home made. I love this dish - I'll try it soon. S has exams going on? Gorgeous pasta dish, makes me hungry!! looks delicious! I like noodles when they are creamy, juicy and simple....I would think it's Curry Tagliatelle, if I didn't read the title. Bombay-Brussels Pasta from scratch wow that is something i have not done. Shyama's exams stats from 12 th till 25 th. Priya hi hi pity we are not living close. Angie i think it has the yellow colour as it was made with fresh pasta. Wow that pasta looks really yummy..
Looks delicious. I love anything with ground nuts & cheese. yummy.. This a delicious pasta recipe. I love the almonds in the pesto!! It's a lovely and comforting dish! I love pesto and am sure the fresh pasta made it all the more delicious. Hey...Thanks for visiting my blog...and I must say, your blog has a collection of very unusual recipes... Sometimes I just want to try these unusual recipes in my kitchen... so your experiments in cooking will encourage me to try this recipes myself... thanks for sharing ... Nice blog. Almonds and Basil in Pasta, I would love to taste it..
Pinky thankyou, hope you will enjoy the visits here. wow this pasta looks good n yummo! I love the vibrant flavors of pesto-- in fact, I wait for summer partly because of all that basil I can grow and devour. This pesto with the tagliatelle sounds delicious, Happy. Gorgeous recipe. Looks awesome. How is it different from fettucine? Mouthwatering! That pasta dish looks so tasty! Yummy-oh! ummm that s an interesting and creamy recipe looks yummmy. yumm pasta.. sound great for dinner :) a must try.. thanx for sharing. nice blog you have.. keep it up!! the name and the dish is quite exquisite..will try it out.. 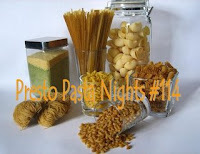 Thanks for sharing such a heavenly dish with Presto Pasta Nights. Hope to see you back often. I love the idea of the almond in the pasta...sounds really yummie...can only imagine the flavor...very nice. What a creamy pasta..recepie name is really exotic.. Delicious pasta, pesto is nice with almonds! This looks so good, I've never used fresh pasta, this is something I need to try. I know it's probably alot better than te dried! YUM! I love the use of almonds in that pesto. I think anything featuring tagliatelle is exquisite. I could barely say the name;) the basil & the almonds sound gorgeous! This looks so moouth watering! I am totally into Almonds in Pesto, yum! I recently made one with cilantro that was delicious. I love how east it can be too. Not only does it sound very exquisite, I like all the ingredients in it. Shall try this one soon. I love pasta - the fresh pasta and home made pesto must have made this dish taste so much better than store bought!! that looks a creamy sauce, indeed! Oh dear u are always good at trying very new and unique dishes. I can't even read it properly. But I m very sure the pesto could have tasted great, just because u have cooked it. Annidivya i am not sure if i am correct but i think one is thicker and the other one is thinner. I love the almonds and tomatoes in the pesto! Great dish! Lovely pasta dish it sounds tasty using the almonds. Pasta looks yummy, the pesto with the addition of almonds looks really delicious that too on fresh pasta. HC, I can taste the pesto now. Delicious easy dish to prepare. From one pasta lover to another, I guess it wouldn't matter how long it would take to make the dish, it sounds very tasty. This looks delicious Happy Cook! lovely...it is lunch time here and I wish I could get a plate of that. that so lovely F..must have tasted great! Looks great...and so easy to make.